“This is probably the greatest discovery in World history” was stated by Maxine Asher, the co-director of a scientific expedition that found Atlantis at the bottom of the ocean reported United Press International (UPI) and major newspapers in the United States during the summer of 1973. UPI continued that “Maxine Asher said that scuba divers found data to prove the existence of the super-civilization which legend says sank beneath the sea thousands of years ago”…”the divers had found evidence of roads and large columns some with concentric spiral motifs, in the exact place described by the Greek philosopher Plato” (beyond the Pillars o Hercules, off Spain). “The group of some 70 scientists, teachers and adventurers was endorsed by Pepperdine University in Los Angeles, CA.” The information is NOT based on any New Age channeling or psychic recall or manifestations. It is primarily based on many ancient writings found around the world. 1. City on the bottom of Atlantic Ocean off Spain, found by Dr. Maxine Asher’s expedition in 1973 and reported by UPI Asher was Interviewed and evidence was Witnessed by Steve Omar, director of the M.I.N.D. International Research Agency,Maui, Hawaii. 2. Pyramid explored by Dr. Ray Brown on the sea floor off the Bahamas in 1970. Brown was accompanied by 4 divers who also found roads, domes, rectangular buildings, unidentified metallic instruments, and a statue holding a mysterious” crystal containing miniature pyramids. The metal devices and crystals were taken to Florida for analysis at a university there. What was discovered was that the crystal amplified energy that passed through it. Brown interviewed by M.I.N.D. 3. Ruins of roads and buildings found off Bimini Island in the 1960s by the photographed and published expeditions of Dr. Manson Valentine. Steven Forsberg, co-founder of the Lahaina Times newspaper dove into these ruins in 1982 to witness them first hand. Similar ruins were also photographed off Cay Sal in the Bahamas. The ruins are of the same construction as the oldest city ever found on land, according to archaeologists, in Tiajuanaco, Bolivia where a calendar was uncovered that shows the exact position of the stars and planets 27,000 years ago. This is more than 20,000 years BEFORE the oldest civilizations in school history books! 4. Similar underwater ruins found off Morocco and photographed 50 to 60 feet underwater. 5. Dr. David Zink found in 1957, off the Bahamas coast, a stylized marble head building block cast in a mold and a construction piece drilled by a bit, as well as a stone column that he reported radiated energy. Forsberg of M.I.N.D. interviewed Dr. Zink and obtained the photographs. 6. A ruined harbor like complex discovered on the sea floor off Bimini by Captain John Alexander. 7. The deep sea diving submarine Aluminaut discovered a well preserved paved road on the bottom of the Atlantic Ocean make of black top magnesium oxide, running along the sea floor from Florida South Carolina. 9. A huge 11 room pyramid found 10,000 feet under water in the mid Atlantic Ocean with a huge crystal top, as reported by Tony Benik. 10. Several acres of white marble-like ruins found on tile ocean floor off Cuba reported by Liecesaer Hemingway. 11. Mysterious dome structures reportedly seen in clear water by several pilots in the Straits of Florida. 12. Soviet expeditions to Atlantic Ampere Seamount resulted in photographs of ruins destroyed by lava (like the Aztecs and Mayans wrote Atlan was destroyed by.) This discovery was in the New York Times newspaper May 21, 1978.The photos were developed by the Academy’s Petrovsky Marakuyev and reported by the deputy Director of the Soviet Academy of Science’s Institute of Oceanography, Professor Aksyonove, who also reported ruins found off Cadiz, Spain in the same area as Dr. Maxine Asher’s previous discovery. 13. 1981 expedition of P. Cappellano discovered mysterious ruins with strange symbols on them on the sea floor off the Canary Islands. 14. 1977 report of a huge pyramid found off cay Sal in the Bahamas, photographed by Ari Marshall’s expedition, about 150 feet underwater. The pyramid was about 650 feet high. Mysteriously, the surrounding water was lit by sparkling white water flowing out of the openings in the pyramid and surrounded by green water, instead of the black water everywhere else at that depth. 15. An urn brought to the surface by Dr. Aher’s expedition. 16. The foundations of a 100 by 75 foot structure photographed on the sea bottom off Andros Island. 17. A sunken city about 400 miles of Portugal found by Soviet expeditions led by Boris Asturua, with buildings made of extremely strong concrete and plastics. He said , “the remains of streets suggests the use of monorails for transportation.” He added that he brought up a statue. 18. A six foot column or spire protruding from a double circular gear-like base embedded in the ocean floor, with peculiar light emanations from the bottom of the shaft showing up in photos taken by Dr. William Bell in 1958. 19. Pillars found on the Atlantic floor in 1969 by Robert Fero and Michael Grumley, a chunk of which was carved from rock NOT found anywhere in that part of the world. 20. A road off the Bahamas explored by Dr. Manson Valentine. 21. Dimitri Rebikoff, using his underwater platform and a special collecting lens, reported ruins found encircling an underwater freshwater spring. 22. 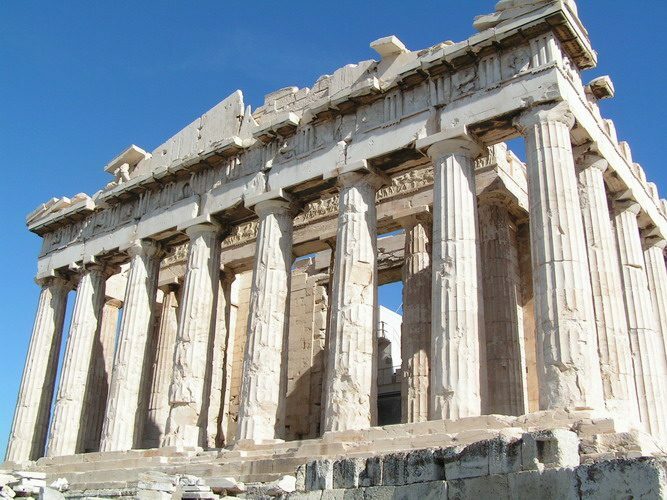 Marble Acropolis underwater across five acres of fluted columns raised on pillars. 23. Heinrich Schilemann, the man who found and excavated the famous ruins of Troy (which historians thought was only a legend), reportedly left a written account of his discovery of a bronze vase with a metal unknown to scientists who examined it, in the famous Priam Treasure. Inside it are glyphs in Phoenician stating that it was from King Chronos of Atlantis! IDENTICAL potter was found in Tiajuanaco, Bolivia. 24. Twenty researchers, including archaeologists, a marine biologist, geologist, and cartographer dived onto ruins on the sea floor off Bimini in 1975 and brought back artifacts from which they concluded that the walls and roads were made of materials not found in that part of the world. Plato and others wrote that Atlantis was a huge continent like Africa, stretching across the Atlantic. The Aztecs, Mayans and Incas and other Indian tribes told explorers of the sunken Atlan in the Atlantic and the sunken MU (Lemuria) in the Pacific. In the Pacific, ruins of an ancient city were explored on the ocean floor off Ponape Island. Another was found underwater 30 miles off Easter Island. A ruined road on Karotonga Island goes into the ocean, runs underwater for many miles, and comes out of the ocean on another island in a straight line! Professor Menzies, from Duke University, photographed a ruined civilization on the sea bottom between Peru and Tahiti with unknown hieroglyphics on a column. Monolithic ruins from a lost civilization were found on a haft dozen South Pacific Islands, which are said to be Lemurian mountain peaks above water. 2. An ancient map that King Henry owned in 1500 A.D. clearly shows Atlantis. 3. Greek documents and maps showing Atlantis that Christopher Columbus studied before he set sail for America, including the 1482 Benincasa Map showing 3 Atlantis islands that no longer exist! 1. Plato wrote a detailed account of Atlantis with its location, later history culture, and destruction. 2. Ancient writings from the Aztecs and Mayans like the Chilam Balam, Dresden Codex, Popuhl Vuh, Codex Cortesianus, and Troano Manuscript were also translated into histories of the destruction of Atlantis and Lemuria. 3. The Oera Linda Book from Holland is said to be one of the oldest books ever found. Adela tells of the destruction of the large Atlantic island by earthquakes and tidal waves. (Note that Phoenician hieroglyphics have been found on numerous ruins in the South American Jungles that are so ancient that the “white” Indian tribes nearby lost memory of who built these ruins.) Diodorus wrote that the Atlanteans had WAR with the Amazonians! 5. The Greek Kantor reported visiting Egypt where they saw a marble column carved with hieroglyphics about Atlantis. 7. Proculus visited the islands off Africa (Canaries or Azores) where the natives told him of the destruction of Atlantis around 450 A.D. long before that date. 9. Herodotus, regarded by some as the greatest historians of the ancients, wrote about the mysterious island civilization in the Atlantic and a city on it located in the region the Dr. Asher expedition found just that! 10. The Greek historian Timagenus wrote of the war between Atlantis and Europe and said tribes in ancient France said that was their original home. (Note that clear bright paintings in caves in France clearly show people wearing 20th century clothing: one painting led to an underground pyramid complex. French historian and archaeologist Robert Charroux dated them at 15,000 B.C. 12. Theopompos (Greek historian) wrote of the huge size of Atlantis and it’s cities of Machimum and Eusebius and a golden age free from disease and manual labor. 13. James Churchward wrote several volumes of books documenting ancient writings he claims to have translated in Southeast Asia concerning Atlantis and Mu, while geologist William Niven claimed to have excavated identical tablets in Mexico. 14. Dr. George Hunt Williamson, who authored several books on his Atlantean- Lemurian research in the 1950’s, was an anthropologist explorer once listed in Who’s Who in America. Williamson wrote how descendants of the Incas led him to an ancient manuscript in a temple in the Andes Mountains that told of the destruction of Atlantis and Mu, which had an advanced technology, by earthquake and tidal waves. Williamson also visited dozens of Indian tribes in the United States and Mexico that told him of Atlantis and Mu, including the Hopi Indians. 15. Tablet from Lhasa. Tibet and also from Easter Island. It is clear from ancient writings that belief in Atlantis was common and accepted in Greece, Egypt, and Mayax (Mayan and Aztec Empires) by historians. The Basques of Spain, the Gauls of France, the tribes of the Canary and Azores islands, a tribe in Holland, and dozens of Indian tribes all speak of their origins in a large lost and sunken Atlantic land. Belief in the large sunken? ???? Human footprints and shoe prints, a perfectly engineered cube, Jewelry, a pre- historic animal with a hole in its skull that scientists admit only a bullet could make, a remnant of a screw, and other modern artifacts have been found in layered rock strata geologists admit formed on these objects MILLIONS OF YEARS AGO! All of these discoveries were printed in public daily news papers when they occurred, and left out books simply because historians could not explain them with THEIR theories. Most all ancient civilizations believed in the TITANS, the race of giant humans that inhabited Earth long ago. Different races knew them by different names. These 7 to 12 foot humanoids were thought to be legendary until the excavation of over a dozen skeletons 8 to 12 feet tall, around the world, shook archaeologists. These skeletons were positively human. Some of these skeletal remains are on Maui in lava caves near Ulupalakua and Olowalu. The Spanish Conquistadors left diaries of wild blond-haired, blue-eye 8 to 12 foot high men running around in the Andes during the conquest of the Incas. A couple were reportedly captured but died en route to Europe. If giant animals (dinosaurs) were possible then why not giant men? The Germans and the Nordic Scandinavians spoke of a vanished continent in the North Atlantic ocean called Thule with the civilization of HYPERBOREA located on it. THULE reported stretched into what is now the northern polar ice cap where it is buried underneath miles of ice so we cannot see it. HISTORY IS A REPETITION OF GOLDEN AGES FOLLOWED BY THE ENDS OF EMPIRES. In the dawn of time, a civilization would begin and advance to greatness, only to be destroyed. Humanity would then regress back to primitive conditions and have to begin all over again. Little trace of the former empire would remain. Ancient historian stated that civilization has been completely destroyed at least 5 times, either by water or fire. The devastation came either in the form of volcanic earth- quakes or a comet (fire) and earthquakes and tidal waves (water). The last END OF AN AGE came with a combination of fire and water combined with man’s inhumanity to man. Waters that are NOW oblivion had become tombs of ice, glaciers buried whole cities. THE REASON FOR WRITING THE EARTH HISTORY IS TO RE-STATE: IT CAN HAPPEN AGAIN! Geologists around the world agree that the ice in Alaska and most other polar lands in the north were tropical thousands of years ago. Many plants, fish and animals native to subtropical climates have been found frozen beneath the Arctic glaciers. Coral and palm trees are frozen in Alaska. Frozen animals were found devouring tropical vegetation, found crushed in herds in the positions of running from some cataclysmic disaster that occurred INSTANTLY. Scientists now have proof that the North Pole has shifted its position several times by many thousands of miles! What was once tropical is now ice cap! What was once glaciers is now the tropics! Here in 1990, EXPERTS AGREE that this reversal will occur WITHIN THE NEXT FIFTY (50) YEARS OR LESS! If our cities were buried by ice thousands of feet thick weighing billions of tons, our scientists agree that it would grind them to dust beyond recognition, accompanied by thousands of years of rust and rot…to dust. Is that what happened to the THULE civilization spoken of by so many ancients? HYPERBOREAN RACE was tall and in excellent physical condition, and some told of how they conquered the aging process and looked youthful in old age. They were reportedly vegetarians and fruitarians who lived in harmony with nature. Although several ancient writers firmly believed in Thule, historians of the Middle Ages, who had no evidence that the north was once warm and therefore inhabited, naturally censored it out of the history books we inherited! Today’s science KNOWS that the far north was once tropical! The South Polar continent of Antarctica was also once ice free, and that fact is clearly shown on the ancient Piri-ries Map seen displayed on television documentaries, which show mountain ranges not discovered until the 1940’s! That map could ONLY have been made BEFORE the ice cap! Even the Eskimos speak of the warm lands in the north that was the cradle of civilization as they knew it. A German archaeologist, Jurgen Spanuth, wrote that he went to Egypt, where he deciphered some hieroglyphics telling of a Lost Empire in the North. In 1953, Jurgen found ruins of an ancient city of unknowns on the bottom of the North Sea, and he produced photographic evidence! During the 1920-30’s, German researchers who were exploring ancient Nordic writings became believers in the lost continent of Thule, and the race of Super men who had existed then during a glorious Golden Age. They were convinced that the Supermen were genetically and culturally the most advanced race in world history, and convinced professors and historians believed that the Hyperboreans had telepathic and cosmic powers, had been destroyed by ice, and that humanity had degenerated. Remember that Nazi science in the 1930’s and 40’s was, in many ways, more advanced than in the United States and other nations. The Nazis had rockets, Jet planes, radar, and many weapons BEFORE any other country…and had superior submarines and the first freeways! In 1945 they were experimenting with real flying saucers that were destroyed in Allied bombings, and the inventors burned the blueprints. The conquering Allies were astounded to find crude but working saucers and tried to reproduce them in strict (yet unsuccessful) secrecy, while captured German rocket scientists invented the U.S. Space Program! Yet even more shocking was the diaries of Nazi leaders who seriously based their world plans on literature about Thule, psychic powers, Atlantis and ancient supermen! The founders of the Nazis believed that they were destined to create the new Super Race that would rule this planet in the future Golden Age. The Nazi leaders were convinced that all of history was in cycles, consisting of golden ages followed by disasters. Hitler stated that the repetition of history required that to recreate the supermen who had come and gone, the Nazis must exterminate all of the inferior races they believed inhabited the planet. It was their belief that it was the destiny of the Nazis, in the universal plan, to manifest the Age of Aquarius and a new race. They believed Earth was near the end of a Cycle when all nations would again be destroyed…by a polar shift, earthquakes, fire and tidal waves. The Nazis had plans to survive in under- ground cities in South America, as they believed the Atlanteans had, those who rounded the Aztecs, Incas and Mayans. The Nazis transferred millions of dollar of their gold and secret armies and many scientists to a remote region in Argentina to survive. The infamous genetic experiments on prisoners in Nazi concentration camps were attempts to manipulate genes to create and breed the New Race, which was to be founded by blond, blue-eyed Nazi SS troops. We are not sure how long ago Thule was destroyed. Some ancient writers claim Hyperboreans became so highly evolved over thousands of years that they became transparent beings (is this the teleportation which our own scientists admit will be possible in the future?) We do know that a beautiful chalice made of zinc and silver with intricate inlaid flower designs all “over it” was excavate 15 feet deep in solid rock that geologists confirm was solidified millions of years ago. In 1851, an engineered iron nail was found in Salzburg, Austria in a perfectly formed quartz crystal which geologists said solidified 12 million years ago. The Hitler Nazis could have done well with their advanced knowledge, yet they misused psychic powers, just like the Atlanteans had done!